[2015 Update: The White Dot didn’t change with all the 2014 Tunxis changes in Burlington, but since I combined my hike(s) of it with trails that did change, I have to change around this page. I’ll try to make it seamless, but if it reads a bit convoluted, I’m sorr- no I’m not. Just deal with it. In total, the White Dot is 9.1 miles long – but I’d only be doing 2/3 of that today, the rest to be done on a different loop hike on a different day. The White Dot’s southern beginnings are rather modest – a road walk along East Plymouth Road in Plymouth. 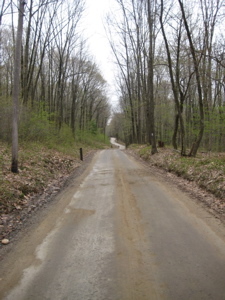 After about five minutes, the trail (still along the road) crosses into Harwinton and then begins it’s journey due north for a couple miles along old roads. 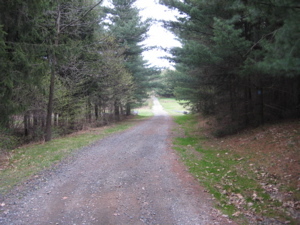 The first bit of old road passes by some interesting historical sites, such as the former homestead of Stephen Graves. 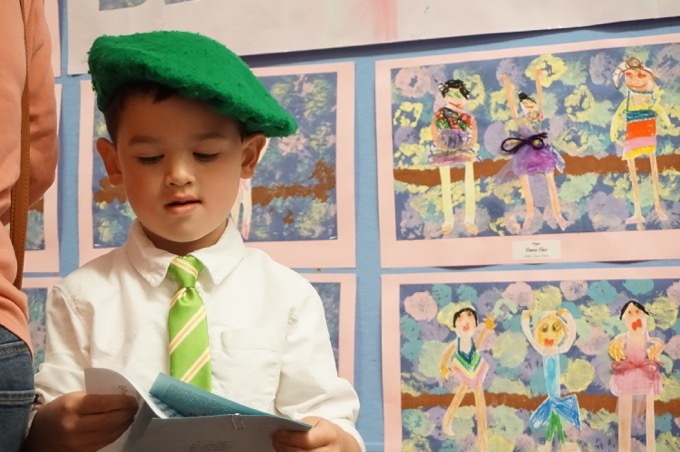 I don’t feel the need to rehash his story, but again, you can read all about it here, in my Tory Den report. Soon I came to the Bristol Reservoir Number 3 land which was just like every other reservoir I’ve hiked past except something silly struck me here. There I was, pretty far off the beaten track, at a fairly remote reservoir owned by the town of Bristol (in Harwinton) and some municipal worker took the time to carefully attempt to reseed some grass along the access road. I just thought it was weird, that’s all. 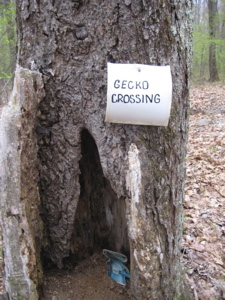 But not quite as weird as coming upon a “Gecko Crossing” sign (with gecko picture) in the hollow of a tree along Blueberry Hill road – a graded dirt road through some very pretty woods. It’s very driveable, but I saw no cars on my hike. 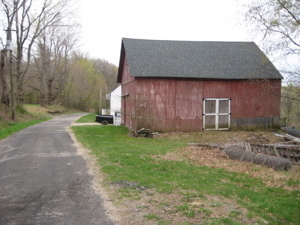 Funny story about this barn/house. I stopped to take a picture and noticed some ring-neck pheasants and other cool birds in a pen just to the right of this picture. So I walked over and started making bird noises at them for a response. It wasn’t until I said, “Hello, Mr. Pheasant” to the pheasant that I noticed the owner of the barn/house standing not 15 feet away just staring at me. He said not a word, nor did I. We nodded at each other and I continued north up the road – totally embarrassed but I quickly got over it. After all, it was 8 AM on a Sunday morning along a nowhere road in Harwinton. The White Dot then veers sharply right for a bit, then sharply right again and skirts a massive beaver dam-created marsh and lake complex. It’s pretty cool what beavers are capable of, but somewhat alarming at the same time. I passed by a young couple who had camped out overnight and continued around the marsh. At some point I crossed back over into Burlington and began heading northeasterly again. That meant I was nearing Johnnycake Mountain road and would pass by some rather massive new homes. 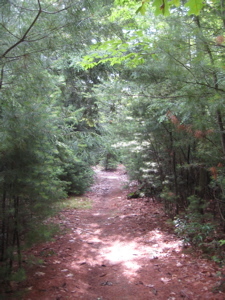 The trail avoids most of the cleared area and even finds a cool little hemlock grove with a large cliff in the midst of the large yards behind the large houses. After crossing Johnnycake Road – hey, what the heck is a Johnnycake anyway? A Jonnycake is an unleavened cornmeal pancake popular in regional American cuisine and strongly identified with Rhode Island foods. A Jonnycake is usually made of lightly sweetened cornmeal and hot water and fried in butter, somewhat similar to fried polenta or thin wheat bread. Jonnycake is often served with maple syrup or other sweet toppings and were popular dating back to colonial times. I’m quite sure they are bland and nasty to our modern tastes. Anyway, the trail is suddenly completely different and crosses open farmland and green fields. 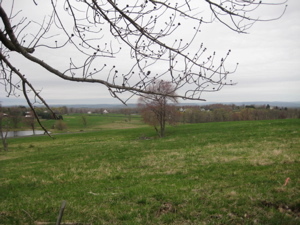 From the 1160′ summit of Johnnycake Mountain, I took in views of the surrounding hills and the Johnnycake Mountain Farm below. There is a cool little register box before the summit, with descriptions of the area. Long story short, the owners of that farm opened up other farms around the country with the Johnnycake name. 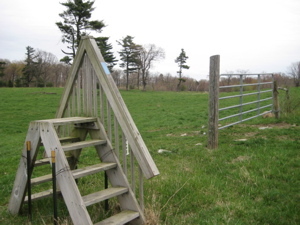 But back to the trail, one must sort of guess which way it crosses this old pasture land to get to the two stiles to climb over the electrified fences. 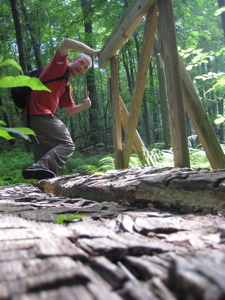 It’s a secret, but the fences are no longer “live,” but it’s still fun to pretend when ascending the stiles. 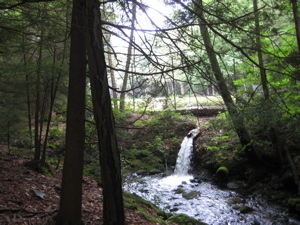 Once through the fields, the trail crosses some hastily made logging roads and gets a bit jumbled before dipping back into the woods and down a reentrant to a little stream. It passes the Yellow Dot Tunxis Mainline intersection and then dips and doodles a bit before climbing up the lower slopes of Wildcat Mountain. 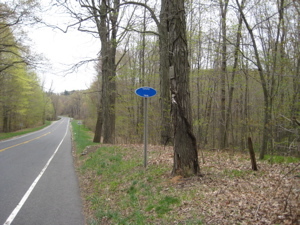 That climb will happen another day, as once I hit Route 69 I turned around, joined the Yellow Dot Tunxis Mainline, finished that trail, picked some fiddleheads and drove home. 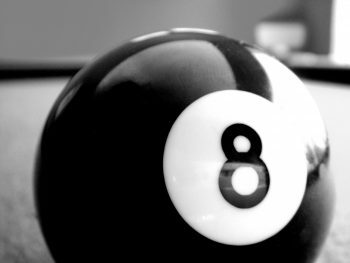 There is one little spot shortly before the crossing of route 69 where one quick camera shot captured 6 blazes at once. Slight overkill, wouldn’t you say? 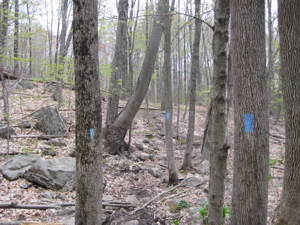 As with all of the Burlington sections, this section hike felt fairly remote – even despite the proximity of some houses along the way. it offered some variation and passed by some pretty cool stuff. If you aren’t a completist, doing the Western bit of the White Dot with the Mainline back down to Plymouth makes for a nice 9 mile or so loop. Ah, my old friend the White Dot! 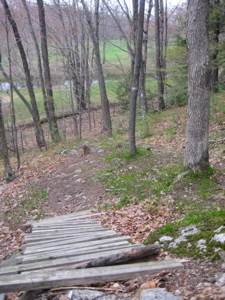 I had previously hiked the western two-thirds of this trail in April, out to Route 69. 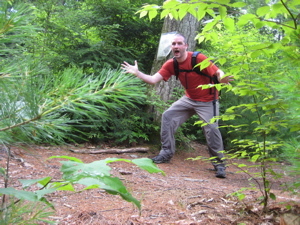 Now, I had to hike west back out to Route 69 again, backtrack that 3/4 mile or so and then head towards home. It’s during sections like this when I really question my sanity as I tiredly descended to the road through featureless terrain. Every step I walked down, I knew I’d be hiking back up in short order. I hate that. 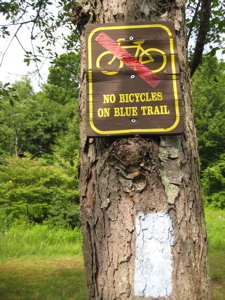 But as a CFPA Blue Trails Challenge completist, I understand what must be done. AND… I’m getting used to it. I felt like I was doing a long “suicide sprint” – down the hill, “tag” Route 69, and then back up the hill from whence I came. This final portion of the White Dot was a very nice way to conclude my hike (of a day full of lots of other non White-Dot miles). 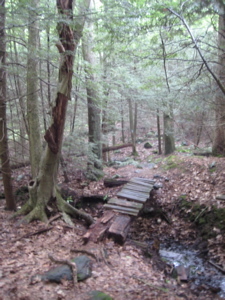 Lots of hemlock and pine, a few nice bridges to cross Belden Brook (which feeds the state fish hatchery) and plenty of wide, soft trail. 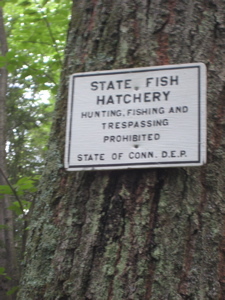 After crossing George Washington Turnpike, which doesn’t exactly look like what someone who has never seen Burlington’s George Washing Turnpike would think a George Washington Turnpike would look like, the trail crossing into the state fish hatchery land. This is real Hansel and Gretel forest here; dark and foreboding – and quite nice. 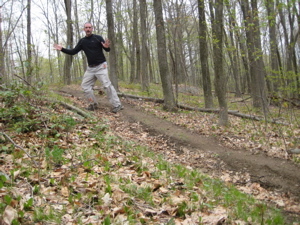 There are side trails that can take you to the hatchery. It’s a pretty cool place that still uses old fishery technology. I’ve visited a few times, actually. The White Dot ends at its intersection with the Yellow Dot trail just before its terminus at route 4. And there you have it. Hiking the White Dot end-to-end is a bit silly, as it doesn’t have any of the super cool stuff the other Burlington region trails have, but at least the trailheads are on roads with parking. 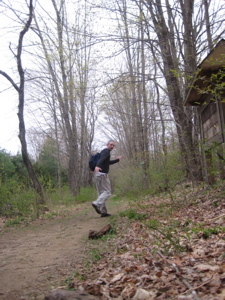 I certainly didn’t do it end to end in one hike, but I’m also a CFPA completist and a Burlington Trail Master completist, so you probably shouldn’t follow my lead. Unless you’re nuts like me.